Exactly eight years ago, I was driving back from a business meeting in Steamboat Springs, CO and began to take notice of a number of pastoral scenes with ranch horses grazing in lush green pastures. Pretty, I thought, but not compelling enough for me to stop. I kept driving, and the green Colorado pastures turned to the dry reddish high desert of Southern Utah. Just outside of Bluff I spied a small band of horses consisting of a stallion, five mares and three foals grazing along the road. I pulled up near them and watched as two mares deftly headed off their two adventurous foals before they reached the road and returned them to the herd. This was worth photographing. So, I opened the car window. Immediately the horses took off and left me behind feeling deprived and defeated. That feeling lasted about one second as I realized that I could drive ahead of them, stop, and photograph them as they came across my field of view. While looking for the best place to stop and wait I instinctively evaluated what part of the scenery would best serve as a backdrop. There was one clear choice with red bluffs in the distance and Spring-green desert vegetation nicely spaced on the reddish soil. With the zoom lens pre-set at 116mm to cover the desired background and the anticipated spread of horses, and a shutter speed of 1/1250 of a second to capture the action I took fifteen individual exposures trying to pick the most decisive moments. The horses were bunched together until the last exposure when they fanned out in a perfect composition matching the landscape. I knew that I had gotten a special image, and stopped shooting. 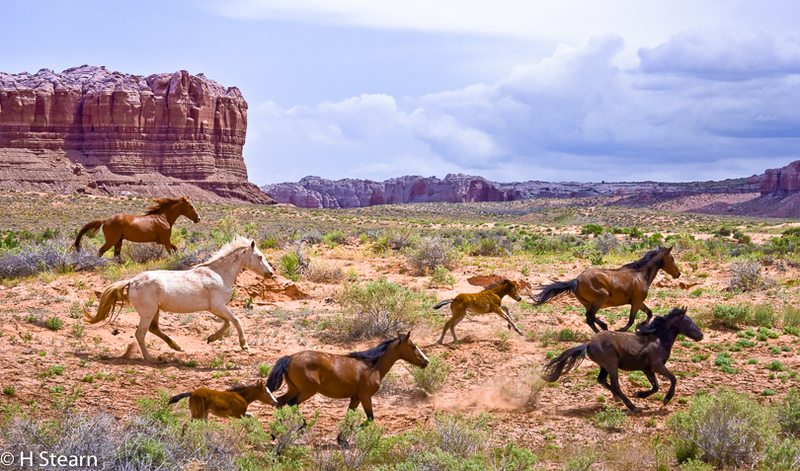 The combination of horses and foals streaking across a vibrant desert just after a spring rain captured the spirit of the American West. “Running Wild” continues to sell better than any image that I ever made. But, more importantly, that experience made me really think about the elements that combine to create compelling scenes. Like many outdoor photographers, I have a hard time concentrating on solely landscape photography or wildlife photography. So, I do both. But, what about the possibility of capturing wildlife in a classic landscape image? Sounds a lot easier to say than to accomplish, but, not impossible. And while that’s the ideal, the concept can also be expanded to include some domestic animals as long as it’s obvious that they belong in that landscape. I chose the term “living landscapes” to describe this type of image, and began surveying magazines like Outdoor Photographer to see how often such images come up. The casual survey revealed that during a two-year period only two images out of over two hundred landscapes showed living creatures as part of a significant landscape. A similar search of wildlife publications showed that the great majority of wildlife images published over a two-year period were close-up animal portraits, with a smaller proportion representing environmental portraits. There were only a few wildlife images showing backgrounds that would have made good images on their own. To be fair, I searched through thousands of my own images to see if my numbers were any different. There were only a few that could be called Living Landscapes. For many great landscapes, animal life is too sparse to find in the right place at the right time. Photographers must either be incredibly patient or incredibly lucky. It is expensive to get to locations that are blessed with both beautiful scenery and abundant animal life, and to spend sufficient time to adequately cover the best sites. Even when both elements are present at the same time, the reflex reaction for many photographers is to take close-ups of the animals and ignore the scenery. But, with effort and planning, much can be done to mitigate all three of these difficulties. For starters, living landscapes don’t necessarily have to include large dramatic wildlife like bears and elk. The goal is to show the connection between an appealing land form or even an intimate landscape and the creatures that inhabit it, be they large or small. By understanding and capturing this connection we reaffirm our own to the Earth and to our fellow creatures. I try to keep this in mind whether I’m in urban or relatively undeveloped environments. 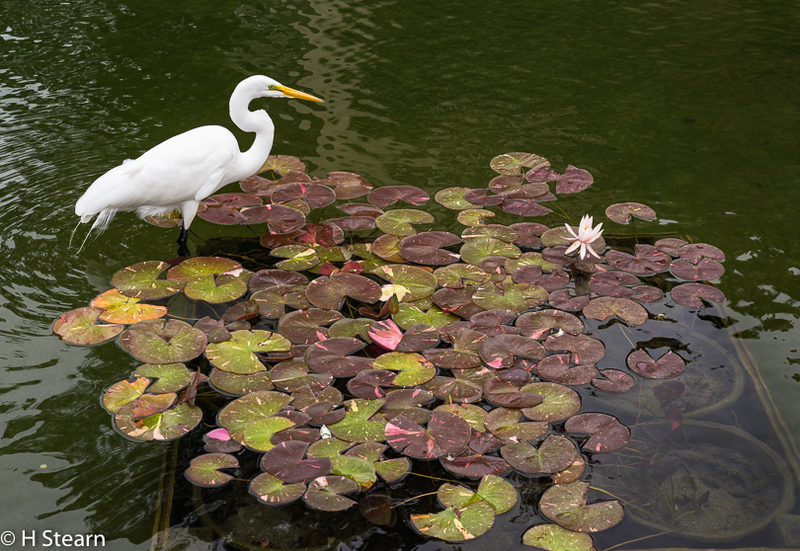 The following image was taken at a koi pond in Balboa Park. I went to this site to photograph the blooming water lilies. But a wild egret looking for an easy meal quickly changed my focus. This wasn’t a rare coincidence. He turned out to be a regular visitor from a nearby estuary. 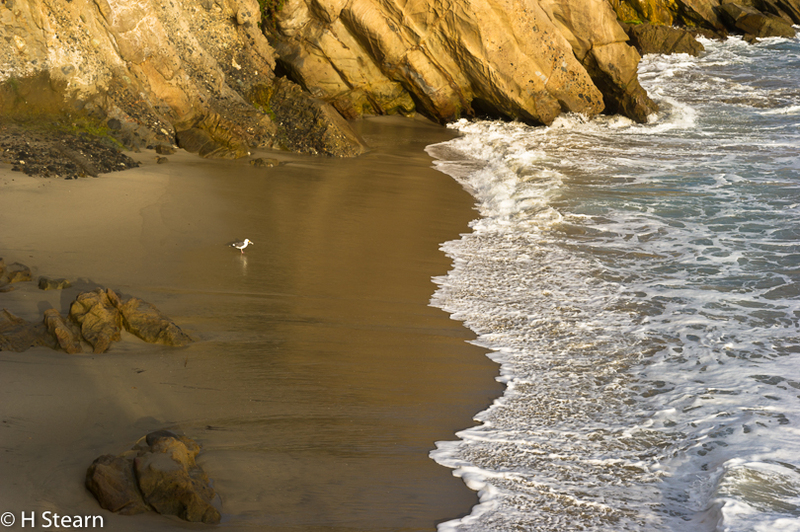 Another time in adjoining Orange County, I was photographing the breaking waves at a popular cove in Laguna Beach. But, something was missing from the scene. I waited until a seagull landed on the wet sand looking for sand crabs. As he searched, he kept an eye out for fast breaking waves. This provided the connection that I wanted. The point of this image is that it doesn’t take a large animal to make a scene more meaningful. 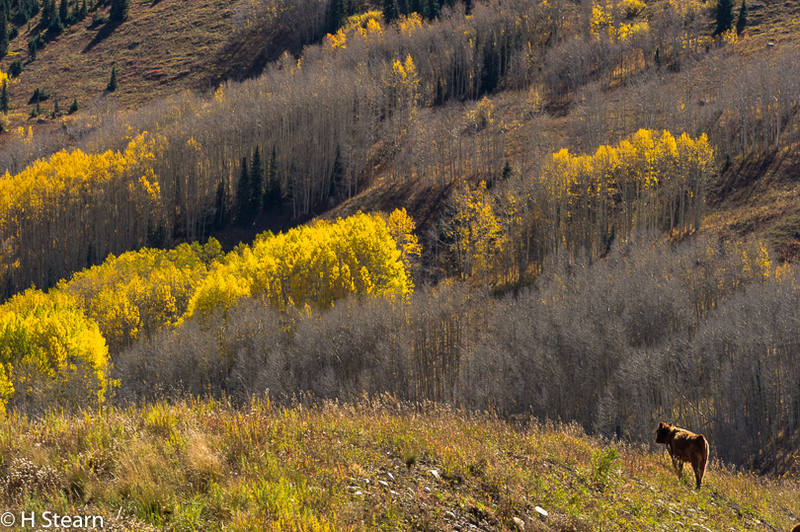 The following image was made in Crested Butte CO on a fall foliage viewing trip. I liked the way that the small aspen groves cascaded down the mountain on a diagonal. Then, I noticed several young steers crossing the road and moving into a corner of the scene. I waited until one was in position to take this image. This wasn’t a “wild” animal, though he lived in the wild with little human help. This scene is more about his perspective as he moved through his home range. The next image again uses a domesticated animal to establish a scene. Only, in this case, the animals are more imposing. 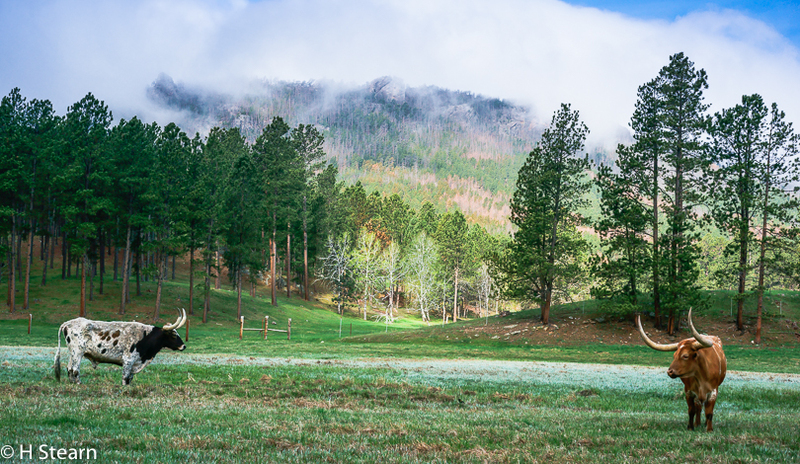 They are large Longhorn bulls who appear to be grudgingly sharing a pasture in the Black Hills of South Dakota. The low lying clouds and emerging sun made editing challenging, but also dramatic. I placed the two bulls at the extreme margins of the the camera image to highlight the tension between the two animals. They seemed to be ignoring the beautiful scene developing behind them as they concentrated on each other. In reality, they’re probably used to each other. But, I like my interpretation better. 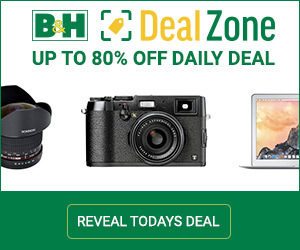 Just about every wildlife photographer has at least one African safari on his bucket list. The expense and preparation involved tends to make this a rare experience, but an unforgettable one. Many outdoor photographers can manage at least one trip to Africa if they make it a priority. As it happened, I already had an African wildlife trip scheduled when I took my Running Wild image in May 2008. Four weeks later I was in Tanzania with a newfound mission to bring back a few living landscapes. There, finding large wild animals to include in the scenes was a no-brainer. The challenge was on the other side of the ledger, as the endless rolling plains seemed to offer little differentiation. But, soon I began to appreciate the subtle beauty of the raw African landscape. The following four images are not as dramatic as some of my classic wildlife “portraits”. But they do convey a sense of the connection between the land and its inhabitants. 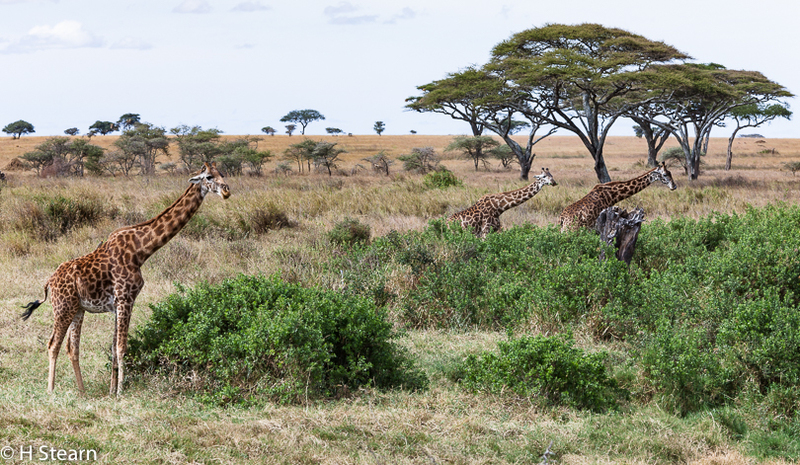 The strong repetitive groupings of the giraffes and the vegetation balance this composition and help reinforce the feeling of an always present connection between the land and its wildlife. The Serengeti is a wide but shallow plain over a huge granite bowl. The granite extrusions that pop up regularly are called Kopje’s, the Afrikaner word for head. Lions will often rest there, while surveying the surrounding plains to observe the patterns of the prey animals that they hunt. This small kopje was photogenic enough by itself. 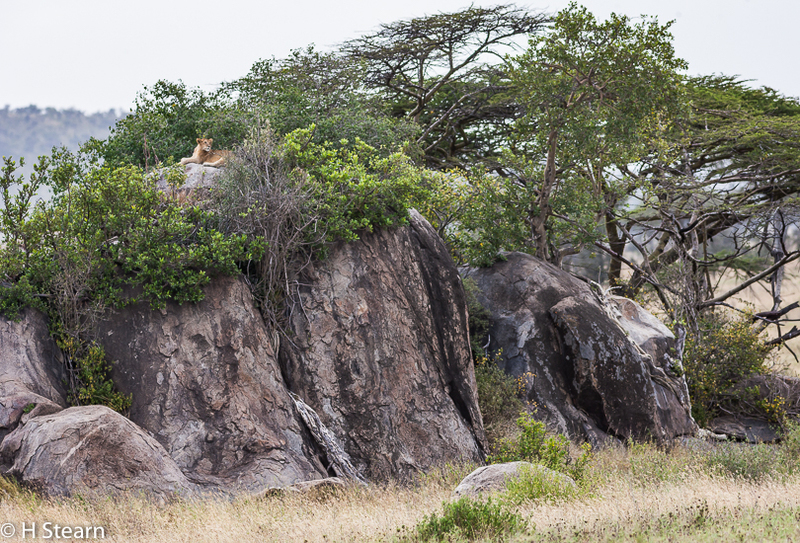 But, the presence of the resting lion provides the interest for this shot even though he is a small part of the image. He is very much a part of this landscape. 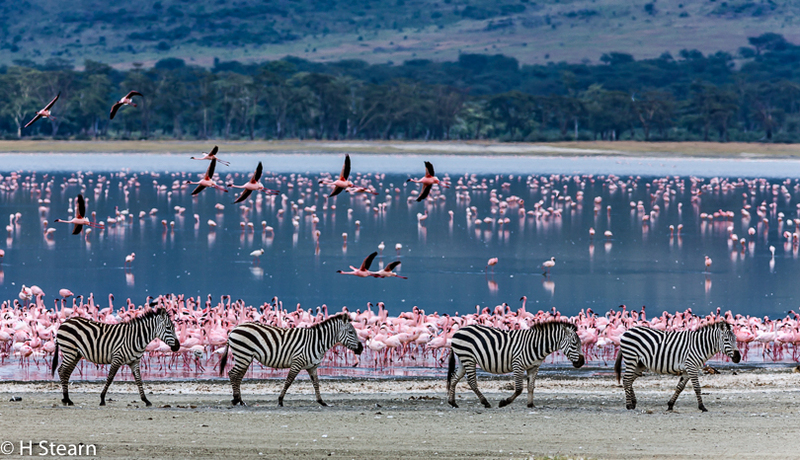 Lake Magadi with its ever-present flamingoes sits in the middle of the huge Ngorongoro Crater, a huge extinct caldera. With a year-round water supply, the wildlife population is stable and non-migratory. All the large game species are found here along with smaller animals like jackals, one of which waded into the slow-moving throng of flamingos and grabbed one for lunch as I watched. The scene had to be observed from the road, as the terrain closer to the lake is fragile. Even a 420mm focal length was challenged to produce a credible image, and much haze reduction was necessary in editing. I instructed the driver that I wanted to wait for the scene to develop and not rush off to the next site. An endless stream of zebra and wildebeest crossed the lakefront. But, after 30 minutes I saw what I wanted: four evenly spaced zebras in single file with flamingoes flying overhead. 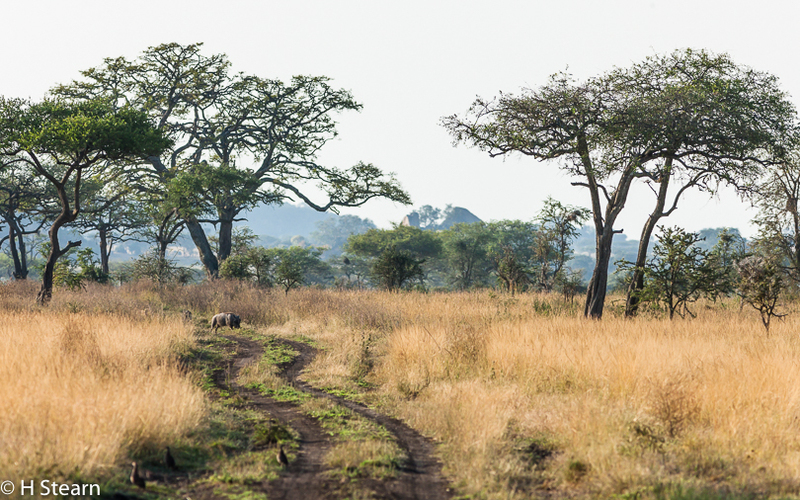 This scene could be almost anywhere in Tanzania, as the bush is repetitive. Composition tends to rely on groupings of trees. But, the wavy jeep tracks introduce a different and intriguing element to this scene, and lead the viewer’s eye to the warthog at the tracks’ end. For a lot less than it costs to go on safari, American National Parks offer many opportunities to capture intriguing wildlife scenes with scenic and even spectacular backgrounds. My favorites – no surprise here – are Grand Teton, Yellowstone, Rocky Mountain and Glacier National Parks. 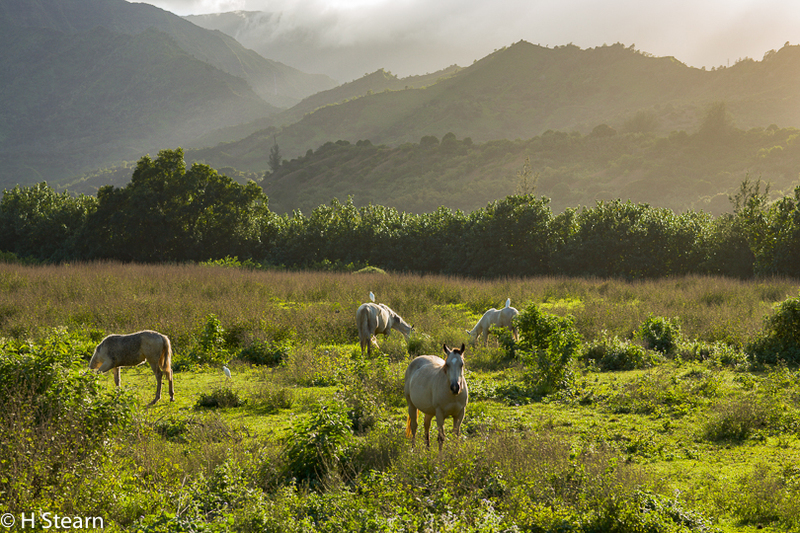 These parks have a super abundance of large animals and spectacular mountain scenery. The locations of major wildlife are reasonably predictable. A little pre-trip research is required updated upon arrival by local sightings information. But, because all wildlife is protected within national park boundaries, the odds of seeing wildlife against dramatic backdrops are higher. 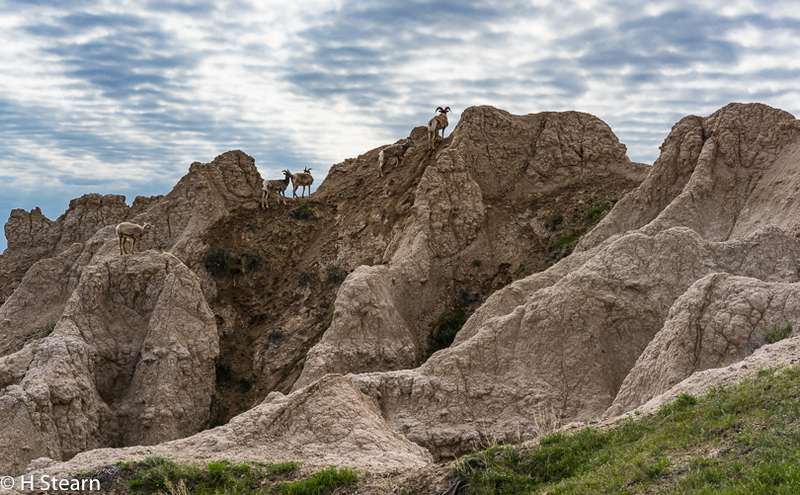 As an example, Badlands National Park in South Dakota is not a place that you would expect to see abundant wildlife. Yet, when I started photographing the sandy formations I quickly ran across more than 30 Desert Bighorn Sheep in one part of the park. In Yellowstone National Park, large numbers of elk and bison hang out in the northern reaches of the park, particularly in the Lamar Valley. And where there are these ruminants there are also wolves and bears, particularly in the Spring. 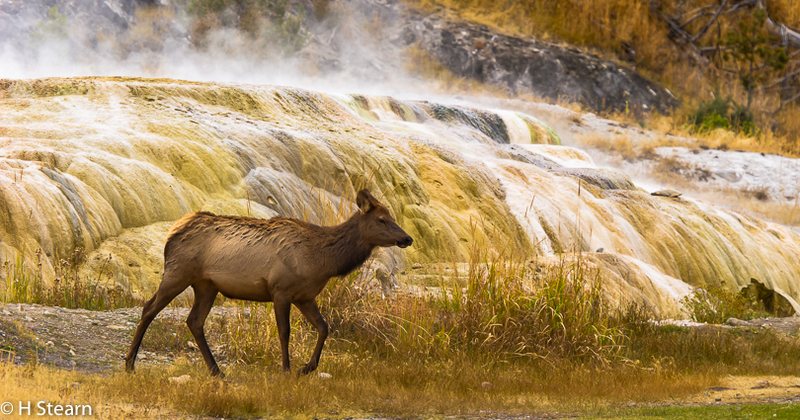 For some years now there has been a resident elk herd at Mammoth Hot Springs. This made it easy to wait for an elk to cross in front of the hot spring mineral deposits to get an unusual image. 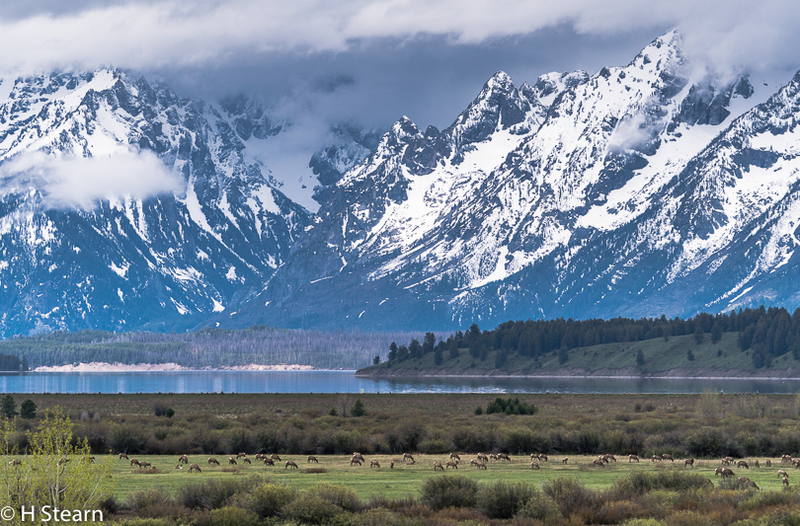 This month, a trip to Grand Teton and Yellowstone National Parks produced a number of rewarding images including the following. Early mornings and late afternoons are best to find and photograph wildlife. And if the landscape is an important element of the composition, morning light is superior, because wildlife will generally hang around for an hour or two after sunrise while the quality of light continues to reveal more detail. These elk migrating through the Tetons toward Yellowstone were found every morning in the Willow Flats area near Jackson Lodge but were mostly gone by mid-morning. 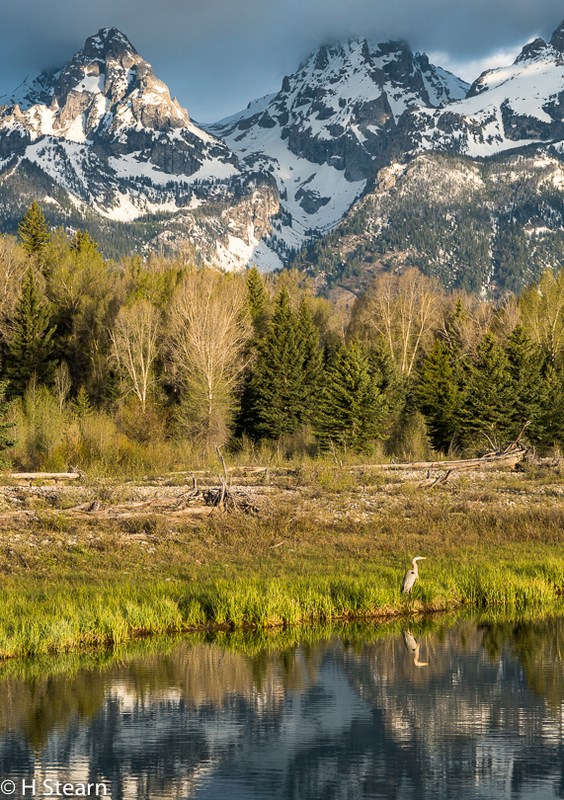 The quality of early morning light on the Teton range was better in the next image, and also provided a vibrant reflection of the Great Blue Heron in the right foreground. 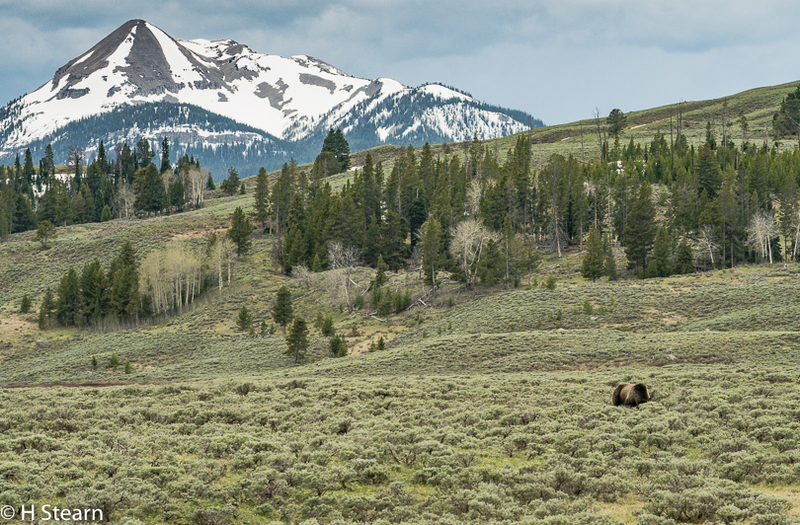 Grizzly bears seemed easier to locate in both the Teton and Yellowstone areas this year. The young sow that I photographed near Jackson junction was not in a particularly scenic setting. 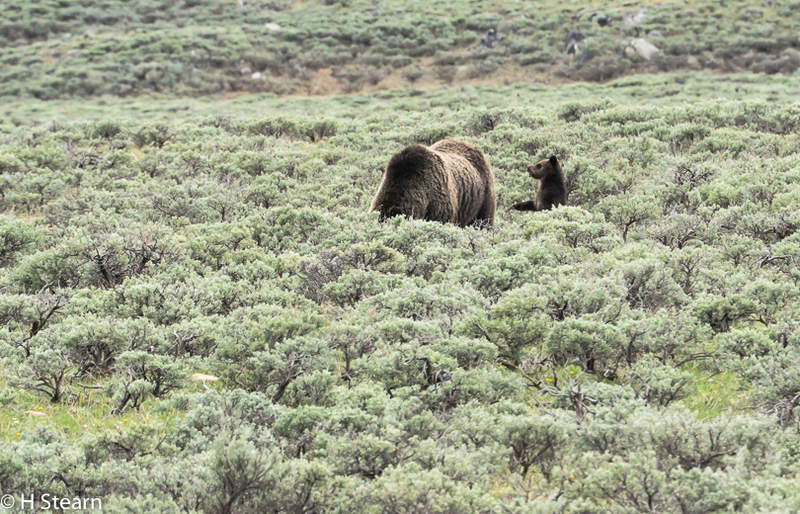 But, the Grizzly sow that I saw in Yellowstone happened to be in a more scenic expanse of the park. However, when I realized that she had two cute cubs I forgot about the scenery and zeroed in on her. After eight or nine shots I suddenly remembered to back off and take a wider more inclusive image of Mama Bear in her broader environment. And this is an important point. It takes discipline to pull back from reflexive zooming in on an exciting wild animal. This bear was the cause of a traffic jam involving at least 50 cars and almost that many people with huge lenses tightly trained on the animal. I’d be surprised if anyone else thought to include her in a landscape except for a few folks with smart-phones. In summary, capturing beautiful landscape compositions that include animal life is a significant challenge. I’ve failed to get engrossing images more often than I succeeded. But, each outing seems to bring a little more success that is the result of patience and effort rather than just dumb luck. I’m a long way from where I hope to be. But, a really great “Living Landscape” is something worth whatever it takes.